AND NOW LADIES AND GENTLEMAN, FOR YOUR READING PLEASURE THE CLEVELAND MOVIE BLOG PRESENTS THE FIRST MOVIE REVIEW IN THE NEW SCHIZOPHRENOSCOPE! Read the first review if you are of a pessimistic and cynical disposition. Read the second review if you are a sunny optimist. Two reviews for one! CAN YOU BEAT A DEAL LIKE THAT?! There's more corn in 2003’s SECONDHAND LIONS than in all of M. Night Shyamalan's SIGNS. This saccharine family pastorale stars Haley Joel Osment, so good in Shyamalan's SIXTH SENSE, here a gawky adolescent, portraying wimp Walter in 1962 Texas. It's a simpler and more badly acted time, and the listless kid is dropped off by his gold-digging single mom (Kyra Sedgewick) at the rural spread of his two eccentric great-uncles, Garth (Michael Caine, beating his Cockney accent into submission) and Hub (Robert Duvall), with orders to locate the hidden fortune of the grumpy old sibs, whose daily routine revolves around firing shotguns at traveling salesman Adrian Pasdar (guess marrying a Dixie Chick didn't do much for his career). Since other greedy relatives are circling, the antisocial coots pretend to treat Walter as their favorite, figuring if one nephew looks like a favored heir, the rest of the vultures will fly away, discouraged. "That's so crazy it just might work," says Hub. Now Caine has paid his bills with everything from ALFIE to AUSTIN POWERS IN GOLDMEMBER, but it's a sad day when Duvall is reduced to dialogue like that. incessant sleepwalking or something, apparently just to show that Osment can tear up on cue. There actually is a secondhand lion in SECONDHAND LIONS, and it inspires a closing-credit salute to a once-popular newspaper comic-strip. Chagrin Falls’ Bill Watterston should be furious. I'm sticking with Harvey Pekar, thanks anyway. As for the kitty litter that is SECONDHAND LIONS, 1 out of 4 stars. indeed masking his delightful accent) as his more thoughtful brother Garth. idling with more money than they know what to do with, guys who buy an old circus lion on a whim? Walter's discovery of the truth coincides with his own steps toward maturity. I was bowled over to see, as a concluding (but perfectly logical) surprise, a takeoff on Calvin & Hobbs, a local-origin newspaper comic-strip we all know and love (Berke Breathed, of "Bloom County" fame, is credited for the artwork). Bill Watterston, of Chagrin Falls, ought to be ecstatic and flattered. 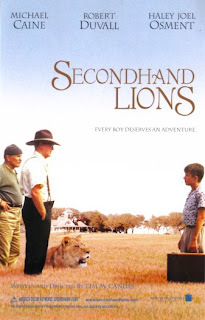 Taking pleasure in its own innocence, magic and suspension of belief, SECONDHAND LIONS is the sort of guileless uplifter the public wishes Hollywood would make more often, and for its warm fuzzies I give it 3 1/2 out of 4 stars. SO THERE, LADIES AND GENTLEMEN, THIS CONCLUDES THE CLEVELAND MOVIE BLOG'S FIRST SCHIZOPHRENOSCOPE REVIEW. A CHEERY GOOD NIGHT TO YOU ALL. What a crummy century this is turning out to be already. I hate this town.